It is a pleasure for me to once again write for Newcastle Journal on my second trip to North East England within three months. I am here to visit Durham University. 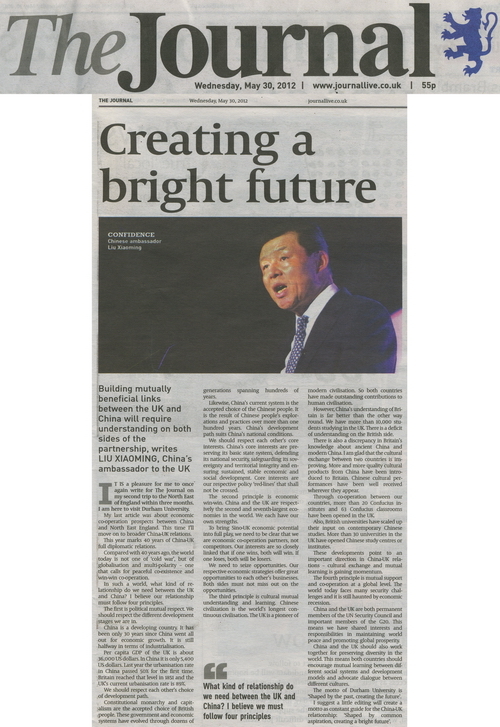 My last article was about economic cooperation prospects between China and North East England. This time I'll move on to broader China-UK relations. This year marks forty years of China-UK full diplomatic relations. Compared with 40 years ago, the world today is not one of 'cold war', but of globalization and multi-polarity, the one that calls for peaceful coexistence and win-win cooperation. In such a world, what kind of relationship do we need between UK and China? I believe our relationship must follow four principles: The first principle is political mutual respect. We should respect the different development stages we are in. China is a developing country. It has been only 30 years since China went all out for economic growth. It is still halfway in industialisation. Per capita GDP of UK is about 36,000 US dollars. In China it is only 5400 US dollars. Last year the urbanisation rate in China passed 50% for the first time. Britain already reached this level in 1851. The UK current urbanization rate is 89%. We should respect each other's choice of development path. Likewise, China's current system is the accepted choice of Chinese people. It is the result of Chinese people's explorations and practices over more than one hundred years. China's development path suits China's national conditions. We should respect each other's core interests. The second principle is economic win-win. China and UK are respectively the second and seventh largest economies in the world. We each have our own strengths. To bring Sino-UK economic potential into full play, we need to be clear that we are economic cooperation partners, not competitors. Our interests are so closely linked that if one wins, both will win; one loses, both will be losers. We need to seize opportunities. Our respective economic strategies offer great opportunities to each other's businesses. Both sides must not miss out the opportunities. The third principle is cultural mutual understanding and learning. Chinese civilization is the world's longest continuous civilisation. UK is a pioneer of modern civilisation. So both countries have made outstanding contributions to human civilisation. However, China's understanding of Britain is far better than the other way round. We have more than 100,000 students studying in the UK. There is a deficit of understanding on the British side. There is also a discrepancy in Britain's knowledge about ancient China and modern China. I am glad that the cultural exchange between two countries is improving. More and more quality cultural products from China have been introduced to Britain. Chinese cultural performances have been well received wherever they appear. Through cooperation between our two countries, more than 20 Confucius institutes and 63 Confucius classrooms have been opened in UK. Also, British universities have scaled up their input on contemporary Chinese studies. More than 30 universities in UK have opened Chinese study centres or institutes. These developments point to an important direction in China-UK relations: Cultural exchange and mutual learning is gaining momentum. The fourth principle is mutual support and cooperation at a global level. The world today faces many security challenges, and it is still haunted by economic recession. China and UK are both permanent members of the UN Security Council, and important members of G20. This means we have shared interests and responsibilities in maintaining world peace and promoting global prosperity. China and UK should also work together for preserving diversity in the world. This means both countries should encourage mutual learning between different social systems and development models, and advocate dialogue between different cultures. The motto of Durham University that I have just visited says: 'Shaped by the past, creating the future'.